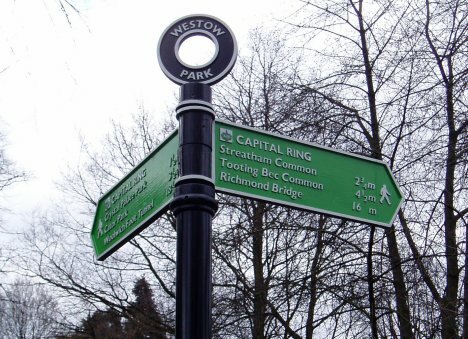 I walked this, the fourth stage of the Capital Ring on the 9th April 2006. This was a very short stage of the capital ring and I also went on to walk the fifth and sixth stages as well. I had an easy journey to Crystal Palace station to rejoin the Capital Ring although it took an hour and half to get there from home which seems a long while for such a short journey compared to how far I could travel in the car in the same time. From Crystal Palace station the path crosses Anerley Hill and heads steeply uphill towards Belvedere Road. Looking back donwhill there were good views across South East London, photo 1. 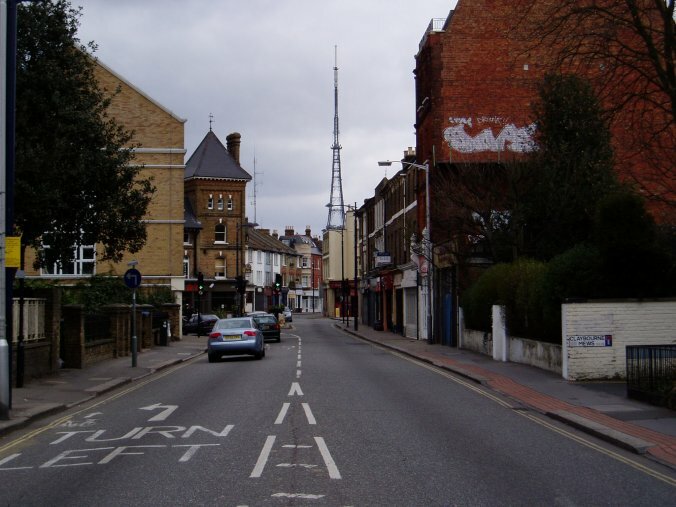 The path then makes its way up to Church Road with the Crystal Palace transmitter mast dominating the skyline, photo 2, before turning into Westow park where the first Capital Ring fingerpost of the day showed a distance of 16 miles to Richmond bridge, my ultimate destination, photo 3. Photo 4 was taken looking back across Westow Park from where it is a short stretch of road walking to Upper Norwood Recreation Ground which the path meanders around following a tarmac track on its way to Hermitage Road. The route of the path then follows Hermitage road uphill to its junction with Beulah Hill where the Capital Ring turns right to run alongside the busy road for some distance until Biggin Hill is reached. On the way at the junction with Convent Hill the break in the houses gives a very good view across to the City of London.The route turns left and starts heading downhill along Biggin Hill, photo 5, past some allotments before taking a footpath that leads past a couple of tennis courts and into Biggin wood, photo 6. The path passes through Biggin Wood to reach Covington Way, seen here at its junction with the oddly named Christian Fields, photo 7,. Covington Way is followed until another area of parkland, Norwood Grove is reached. The path climbs uphill through the park passing the house of the same name at the top of the hill, photo 8. The path passes around the house and takes a fenced path that leads gently downhill towards Streatham Common. Even though the Capital Ring is very well signposted I missed the track at first and headed up to Ryecroft Road however this was more down to me not paying atention to the direction the signpost was pointing than any problems with the signs themselves. 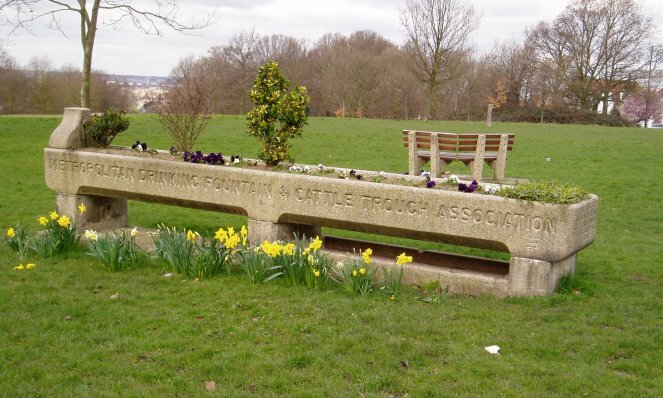 At the top of Streatham Common the path passes an old Metropolitan Drinking Fountain and Cattle Trough Association drinking fountain although this has now been planted with flowers, photo 9. This was one of a number of such troughs I passed through the day and it made me wonder how many there are still scattered around London and the suburbs. I remember passing another one near Crews Hill on the Hertfordshire Chain walk. The path descends down the side of Streatham Common, photo 10, towards the A23 passing a nice looking tea hut on the way although it was a bit early to stop for a snack. There was a kite festival being held on the common. Although most of this still seemed to be in the process of being set up there were a number of kites flying, photo 11, and the usual selection of fast food stalls which seem to folllow such outdoor events around. The route of the path crosses Streatham Common North at the far corner of Streatham Common and then crosses the A23 Streatham High Road and turns left down Lewin Road, photo 12. The path goes down the length of Lewin Road to its junction with Estreham Road. Here a short walk to the left leads to Streatham Common Station and the end of this suprisingly hilly stage. I however turned to the right to continue straight onto the fifth stage of the walk. The GPS made the length of this stage 3.64 miles long.